Dry Fire Tips - PARA Utah Shooting instruction. After spending a week with Massad Ayoob, his students, and the range staff for the Gun Dudes fourth MAG40 class and then shooting a GSSF match. In which prelims show I took first in Civilian class. I would like to relate some of my observations in regards to handgun training. Mas handing over a signed $1 bill to Tom for tying his Qualifier score. There were so many good shooters attending the class. All where safe and attentive and applied the techniques that where being taught. I wish I could of had more time one on one with them all but that wasn’t possible. I had the opportunity to spend time dry firing in the motel with a student named Richard. 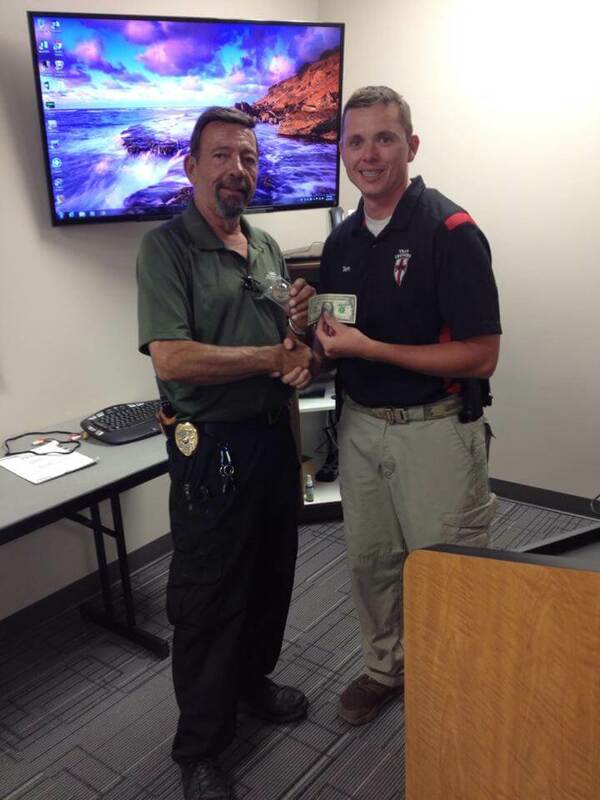 He is a USPSA shooter that hails from Colorado, and is very competent with his Glock pistols. In that cramped room I was able to demonstrate how I dry fire with the help of Nate Osbourne demoing my methods and running a timer while I took a spin. While working with Richard I saw huge improvements in his draw, reloads and the way he approached making his par times. Seeing his rapid progress it reminded me of my journey since putting into practice a daily dry fire routine.In late 2013 I felt adrift in my practical shooting. I wasn’t improving fast enough to be really competitive in my IDPA club or state matches. I would come in around the top but it was inconsistent. At the beginning of the year I started to regularly dry fire after work. Just working on my draw and reloads on some Shot Master Targets. Like many others my sessions lacked depth, so they got real boring, real quick. The cure for my lost interest was crushing par times, moving drills and up to 9 target arrays to clean with 2 shots each in 6 seconds. What my practice needed was more failure. In our efforts to improve we sometimes take practice from trying to succeed and turn them into stroking our egos. So here are some tips to get you going again. What ever your par times are in live fire cut them in half for dry fire. Never work on your draw as a stand alone drill, alway place it in a larger CoF. Movement drills will set you apart from the rest of the club. Back, forward and horizontal movement while shooting at 2″ targets will show you how to pace your movements and trigger. No more slow fire focus drills, shoot all targets to a par time, even if it is somewhat generous. Buy a camera that you can record your sessions, delete, save or share it with someone you respect for necessary correction. Weak hand shooting is vital, make a session out of it. The most important lesson is to just set apart a pair of up dry fire pants. Belt, holster pouches and dummy rounds. Just put them on and get your reps in. Everyone else is getting better and you’re getting older. Don’t waste your time looking at the guns the pros shoot on the internet, when you could become the pro dry firing your own gun now.